BEIJING -- The Chinese government on Tuesday criticized U.S. President Donald Trump's decision to label Beijing a strategic rival and called on Washington to "abandon a Cold War mentality" and accept China's rise. Trump's decision reflects a "victory of hardliners" in his administration, the official Xinhua News Agency said. It warned U.S.-Chinese economic relations were likely to face "even more pressure and challenges." "We urge the United States to stop deliberately distorting China's strategic intentions and abandon a Cold War mentality," said a foreign ministry spokeswoman, Hua Chunying. "Otherwise it will injure others and damage itself." Trump's report Monday hit a series of sore spots for Beijing. It affirmed ties with Taiwan, the self-ruled island the mainland government claims as its territory, and pledged to "re-energize our alliances" with Southeast Asian governments, some of which have conflicts with China over claims to portions of the South China Sea. The United States and China share one of the world's biggest trading relationships and co-operate in areas from clean energy to public health. But Beijing sees Washington as an obstacle to its ambitions to be East Asia's dominant power, and strains over Taiwan, trade, technology policy and the South China Sea are growing. "It is selfish to put your national interest above other countries' interest and the mutual interest of the international community," said the Chinese Embassy in Washington in a statement. "The Chinese side is willing to have peaceful coexistence with all countries," said the embassy statement. "The United States should also adapt and accept China's development." U.S. officials are uneasy about Beijing's rising military spending -- already the second-highest behind Washington. They see President Xi Jinping's "Belt and Road Initiative," a project to build railways and other infrastructure across countries from Asia to Europe and Africa, as part of efforts to erode American influence and nurture a China-centred political structure. Trump's report promises to "maintain our strong ties with Taiwan" and provide for its "legitimate defence needs." "The Chinese government is also anxious," said Xiong. He said the Chinese diplomat's remark is a "warning out of real worry that something may happen unexpectedly." On Monday, Chinese warplanes flew around Taiwan in what the military said was a test of their "ocean combat ability." Taiwan's defence ministry said Japan launched fighter planes to track the Chinese aircraft, but the Japanese government would not confirm that. Trump's report promises to "re-energize our alliances" with governments including the Philippines and Vietnam, which have conflicting territorial claims with Beijing in the South China Sea. It also pledges to expand military co-operation with India, a country Beijing sees as a rival. The report is another abrupt turn in Trump's stance toward Beijing, which has veered between blistering criticism on trade and currency and optimism about co-operation on North Korea and other problems. "China seeks to displace the United States in the Indo-Pacific region, expand the reaches of its state-driven economic model, and reorder the region in its favour," the report says. In April, Trump announced that he was setting aside complaints about trade and currency in hopes of winning Chinese co-operation on North Korea. U.S. officials resumed criticizing Beijing in July. Trump switched back to friendly overtures during a visit to Beijing in November. He said the two sides could solve most of the world's problems if they co-operated. 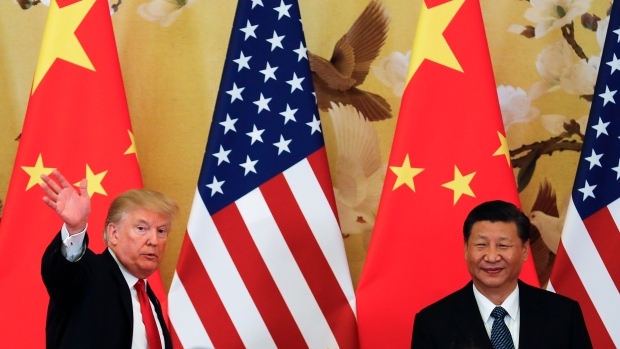 The Global Times, a newspaper published by the ruling Communist Party, said the report "reflects Washington's reluctance to accept the reality of China's rise." "It is impossible for the United States to restrain China," said the newspaper, known for its nationalistic tone. "As China continues to grow and its influence continues to spill over, this is the root cause of Washington's anxiety."